The Homeland Security Department has not proven a need for the 15,500 agents and officers President Trump requested in a January executive order, according to a new report, and would require more than 1.2 million applicants to fill the positions if current hiring and attrition rates persist. Customs and Border Protection and Immigration and Customs Enforcement have not demonstrated what operational purpose the hiring spree will address, the DHS inspector general found, nor have they developed an adequate plan to deploy the new employees. Trump’s order delivered on a campaign promise to recruit a new cadre of law enforcement personnel to enforce border security and immigration laws. Current drafts of fiscal 2018 spending bills would provide funding for CBP and ICE to hire an initial 10 percent of the their total goals. That hiring, however, is already underway; the Office of Personnel Management granted both CBP and ICE two-year direct hire authority in April to hire a total of 19,000 employees to fulfill Trump’s mandate and existing shortages. The agencies are moving forward without a “comprehensive workforce staffing model,” the IG said. That model should set a strategic direction, identify skill gaps, and develop, implement and revise an action plan. The auditors expressed concern that in the past ICE and CBP have failed to properly link their hiring to needs or to determine the best ways to deploy new workers. Again in this instance, those same failures have resurfaced. “Neither CBP nor ICE could provide complete data to support the operational need or deployment strategies for the additional 15,000 agents and officers they were directed to hire,” the auditors wrote. CBP told the IG it was still three or four years away from “implementing a process to obtain and analyze accurate operational needs and deployment data.” By their own admissions, the agencies did not come up with their hiring targets themselves. Rep. Bennie Thompson, D-Miss., the top Democrat on the House Homeland Security Committee, said it was "no surprise" Trump called for a "deportation force" without a plan to hire or deploy it. 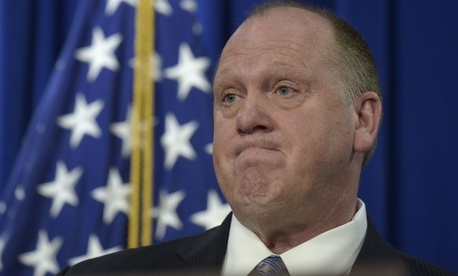 “CBP and ICE already face numerous challenges with recruiting and hiring qualified applicants and forcing this massive hiring surge will only exacerbate underlying problems at both agencies," Thompson said. "Instead of rushing to fulfill campaign promises, this Administration should understand that skimping on workforce planning is an irresponsible waste of limited resources." CBP and ICE both maintain rigorous onboarding procedures and relatively high rates of turnover. As of March, for example, just one in four CBP applicants were able to pass the mandatory polygraph test. The agencies are developing strategies and pilot programs to ease the process, but have maintained they will not compromise their standards to increase speed. Based on current hiring and attrition rates, the IG estimated, CBP would need 750,000 applicants to fill Trump’s order, while ICE would require 501,000. The agencies must compete with other law enforcement agencies and each other, they told the auditors. CBP is especially concerned that potential recruits will instead be drawn toward ICE’s better pay and more desirable locations. The agency has pressed Congress to bring equity to the agencies’ pay rates. It is also boosting recruiting from the military, while ICE has launched a new program to accept applications unconnected to any specific job vacancy. CBP may not be properly utilizing the employees it already has on board, the IG said, noting that just 12,000 of its authorized 21,000 border agents are currently deployed to and conducting missions at the Southwest border. One-quarter of its agents are in leadership and administration, while 15 percent are in other areas or in non-border missions. CBP should consider sending employees in alternate roles to the borders to assess whether it actually needs more agents, the IG said, noting it was an unnecessary expense to place law enforcement personnel in administrative positions. In fiscal years 2012 through 2016, the IG noted the number of BP agents dropped 7 percent while apprehensions jumped 15 percent. Additionally, apprehensions have plummeted in early 2017. The IG noted a 2016 report finding human resource shortages contributed to slowing hiring at DHS components, adding that the department maintained duplicative, fragmented and paper-based HR systems. DHS employs one HR employee for every 148 workers; the federal average is one for every 94 workers. CBP and ICE have vowed to hire an additional 160 and 200 HR personnel, respectively, including through the use of detailees from OPM and other agencies.